For decades, savvy Massachusetts policy entrepreneurs have learned to use the threat of a statewide ballot initiative to compel legislative change that would never have happened absent the ultimatum. I saw this up close in 1994 when Common Cause forced major campaign finance reform through a Legislature eager to avoid the group’s more punishing ballot proposal. In 2000, health care advocates used this strategy to win passage of a managed care patient bill of rights. In 2014, the Massachusetts Nurses Association used the tool to score a new policy in their 20-year grudge match with the Massachusetts Hospital Association over state-mandated nurse/patient staffing ratios. Used well, the strategic ballot initiative is a proven and powerful public policy tool. Between now and early July 2016, when SEIU will decide whether to file their final set of 10,792 voter signatures to qualify for the November ballot (they filed their first, larger set of more than 130,000 signatures in November, well above the 64,750 threshold), expect an awkward dance involving hospitals, insurers, the SEIU, and various state officials to see if the parties can make legislative music together. 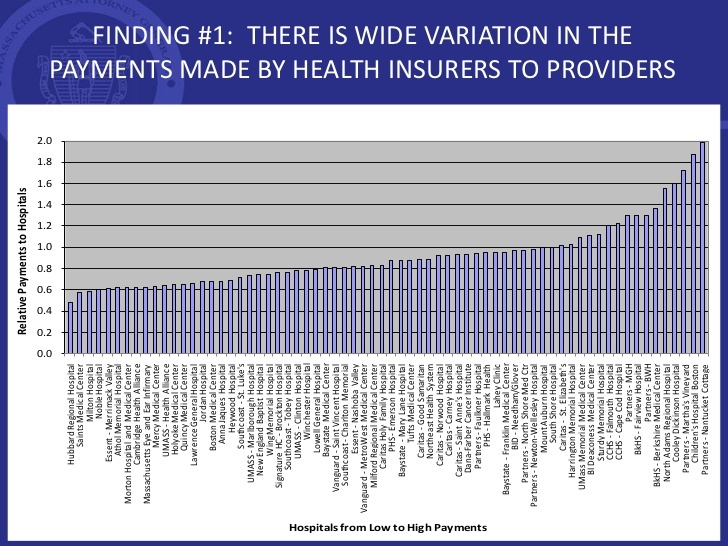 Expect anything from zilch to enactment of the nation’s first state law to address hospital-pricing variation. If the initiative goes to the November ballot, expect a high-spending all-out war. In 2012, Gov. Deval Patrick signed a significant new law, known as Chapter 224, to establish the nation’s first statewide limit on overall health care spending—a “soft” cap without clear penalties for overspending, yet serious enough for all parties to heed. The House of Representatives had sought to address price variation by including in the legislation a high-cost hospital “luxury tax,” but that provision was dropped from the final law at the Senate’s insistence. Chapter 224’s macro “total medical expenditure” cap—limiting spending increases to about 3.6 percent per year—took effect in 2014. SEIU’s political director, Tim Foley, says that the 2014 closures of unionized Quincy Medical Center and North Adams Regional Hospital woke up the union to the serious financial straits facing community hospitals and other vulnerable institutions across Massachusetts. “We recognized that 224 baked in inequities among hospitals and the closings in Quincy and North Adams made it personal for us,” he says. SEIU submitted the “Massachusetts Fair Health Care Pricing Act” as both legislation (sponsored by Sen. Ben Downing of Pittsfield) and a ballot initiative. The proposal would require any licensed commercial insurance company operating in Massachusetts to limit provider reimbursement to no more than 20 percent above or 10 percent below “the carrier-specific average relative price for that service” and further requires that any net savings to insurers “be reflected in reduced premiums, co-pays, and deductibles” to policy holders. The redistribution in hospital payments under this scheme would be dramatic, as outlined in the table below, which shows SEIU estimates using 2013 data from the state Center for Health Information and Analysis. Some sources doubt the SEIU estimates, though they have no counter data to offer. Every expert and industry leader with whom I spoke agreed that the consequences would be profound by redistributing more than $450 million annually from the Partners system and South Shore Hospital to other hospital systems and to health insurance premium payers (Partners’ 2013 total operating revenue was $10.3 billion), and, importantly, by making state government responsible for hospital finances for the first time since 1991. For a proposal with such consequences, one might have expected a more dramatic public hearing than the one that occurred in September in front of the Legislature’s Joint Committee on Health Care Financing. Only two Tims took time to testify—Tim Foley from SEIU and Tim Gens, executive vice president and general counsel of the Massachusetts Hospital Association (MHA), the trade association for most of the state’s hospitals (for-profit Steward Health Care, with nine community hospitals, is the prominent non-member). But widespread agreement on the problem is weakened by a lack of consensus on a policy to address it. Steve Walsh, the executive director of the Massachusetts Council of Community Hospitals and the former cochair of the Legislature’s Health Care Financing Committee that created Chapter 224, agrees that there are “significant concerns about price disparities and no consensus on a correct approach.” All hospitals resist setting health care policy through the ballot initiative process, and many are uncomfortable with re-establishing state regulation of hospital finance, an approach Massachusetts followed from 1975 until 1991, when that system was deregulated. One outlier in the hospital community worth watching is Steward, the for-profit hospital chain formerly owned by the Catholic Church, and an ardent critic of Partners’ market power. Workers at Steward’s nine hospitals are represented by the SEIU, a link that could prove helpful to the union’s efforts. The big payers—Blue Cross Blue Shield, Harvard Pilgrim Health Care, and Tufts Health Plan—have been publicly silent and their officials reluctant to go on the record. Though they dislike Partners’ outsized market power within Greater Boston, they see other regional hospital monopolies untouched by the SEIU effort, and worry about the impact that renewed rate regulation may have in propping up inefficient hospitals. For the time being, they watch from the sidelines. Sometime in early spring, the Joint Committee on Health Care Financing is likely to convene a public hearing on SEIU’s initiative, a proceeding that is certain, this time, to attract more than two witnesses. Whether House or Senate leaders will actively engage to broker a deal is unclear. Many observers believe that Partners’ sizable financial advantage would overwhelm SEIU in a full-scale ballot campaign in the fall of 2016. But in the crowded campaign season with a presidential election and many other high-profile ballot questions competing for limited TV airtime, the outcome is unclear. The SEIU initiative would restore state hospital payment regulation after 25 years of a deregulated hospital market to a level never attempted before in any state. Ironically, the 1994 creation of Partners HealthCare was one of the earliest and most significant consequences from the 1991 deregulation. I served in the Legislature during the final six years of Massachusetts hospital rate setting between 1985 and 1991 and saw incessant lobbying by every hospital in the state for legislative deals to manipulate statutory reimbursement formulae to their own advantage. The consequences of renewed hospital finance regulation would go way beyond price variation in positive and negative ways that no one can predict. The best outcome would fit with the gestalt of the strategic ballot initiative: The initiative threat compels stakeholders to agree on a deal that leaves all better off than they would be under the initiative’s formula. If that is to happen, state leaders will need to step in because the stakeholders will be unable to do it themselves. Next Next post: Bernie Sanders and Hillary Clinton on Health Care – Who’s Got the Plan?